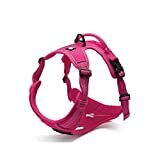 * Variety Sizes: the pet harness has 3 different sizes (M,L,XL) which perfects for various pets. Suitable for: Teddy, Chihuahua, Miniature pinscher, Schnauzer, Samo, Husky and other pets. 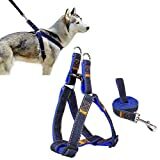 * And it’s simple to put on-just slip the harness over your dog’s head and clip the quick release buckles around his midsection. * Machine washable, but hand washing and air drying are recommended! * IMPORTANT Please Measure Around Head to Make Sure Head Can Pass Through the Neck Opening. Very Important to Measure Before Buying, Do Not Buy Based on Previous Owned Brands, Measure to Get an Exquisite Fit! * Important! Our harnesses are a different and more innovative design, so please do not base sizing off of other companies sizing. Animals come in all shapes and sizes. Therefore, please measure to get an exquisite fit. * Medium:W/L 0.59″*47″ in Chest Girth: 13.8″-19.7″ ; Weight:120g;Suitable for a small breed dog. Great for dogs from 6 to 17 pounds or more Ideal for Yorkshire Terrier, Chihuahua and similar sized breeds. * Large: W/L 0.79″*47″ in Chest Girth: 17.7″-23.6″ ; Weight:190g;Suitable for a medium breed dog. Great for French bulldog, Cocker Spaniel and similar sized breeds. * XL: W/L 0.99″*47″ in Chest Girth: 23.6″-31.5″ ; Weight:260g;Suitable for a medium breed dog. Suitable for a medium breed dog. Great for dogs from 25 to 55 pounds or more Ideal for Collie, Corgi and similar sized breeds. * Durable Materials: Made of strong The cowboy nylon, wear-resistant and durable. * Note: Since the size above is measured by hand, the size of the actual item you received could be slightly different fromthe size above. Meanwhile, please be reminded that due to lighting effects, monitor’s brightness / contrast settings etc, therecould be some slight differences in the color tone of the pictures and the actual item.